“The Incredible 6,000-Foot Ladder to Heaven” follows 12-year old Hadley Breaker as she embarks on a journey to build a 6,000-foot ladder to heaven. The musical premieres Friday and runs through Feb. 23 at the Edge Theater. Ryan Martin and Elliott Hartman came into Northwestern University with a mutual love of theater but no definite plans of where to take their passions. They evolved from freshman-year roommates to classmates to friends, and have since graduated and become collaborators on Martin’s new original show, which is set to premiere this week. 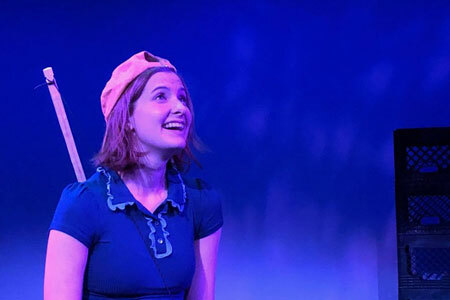 Written, directed and performed by Northwestern alumni, “The Incredible 6,000-Foot Ladder to Heaven: A New Musical Fairytale,” will premiere Friday as part of the Chicago Musical Theatre Festival. The musical, which Martin describes as a moving story about loss and grief, runs through Feb. 23 at the Edge Theater. Playwright and composer Martin (Communication ’17) said the musical took root during his final year at NU and is based off his personal experiences with grief as a young adult. In the musical, 12-year-old Hadley Breaker, grieving the loss of her father, embarks on a journey to build a 6,000-foot ladder to heaven. Martin added that being involved in writing the student-written Waa-Mu Show his senior year inspired him to create his own musical. He said he started working on “The Incredible 6,000-Foot Ladder to Heaven” during his last couple weeks at NU. The Purple Crayon Players performed a staged reading of the piece in 2018, Martin said, but Friday will be the the first time his production will be fully staged. Director and recent NU graduate Hartman (Communication ’17) said producing the musical has been both a joy and a challenge, since the Chicago Musical Theatre Festival requires that musicals selected for production meet certain guidelines. Hartman said being the first director to interpret Martin’s musical was an exciting challenge, because he was able to make artistic decisions about the portrayal of “otherworldly characters” and stage designs that evoke the idea of heaven. To Hartman, directing a never-performed work of theater requires him to interpret the story, find meaning and choose actors based on their strengths. He said another exciting dimension of producing new work is that actors have room to interpret their own roles. NU alumna Rachel Guth, (Communication ’18) who plays the lead role of Hadley Breaker said she feels like she really “clicks” with her character. Guth said her love for acting in new work began at NU. The actress, who was also involved in the Waa-Mu Show, said that her experience helped her learn to adapt to experimental works. Martin said his creation would not have been possible without the “interest and tools” born from his time as an NU student. He added that there is value in seeing NU alumni productions for both aspiring student writers and the greater student community.